ICAR Lucknow Recruitment 2019 Walk in Interview Jobs in Lucknow, 12th Pass IISR Lucknow Sugar Institute Jobs for Freshers, Professional Jobs in Lucknow Chini Vibhag, Ganna Vibhag Bharti. 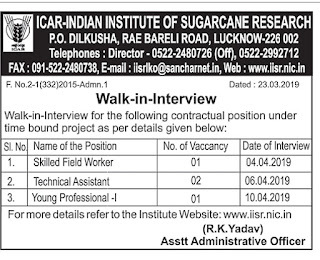 Name of the Department: ICAR Indian Institute of Sugar Research. Address: P.O Dilkusha, Raebareilly Road, Lucknow 226002. Telephones 0522 248 0726, 0522 299 712. IISR Lucknow Recruitment 2019: Walk Interview For the Following Contractual Position under the time Bound project as per details given below. Salary: Rs. 15,000/- to Rs 25,000 per month fixed. Age Limit: 21-45 years (age relaxation will be applicable as per govt. rules). 2. Diploma/Certificate course on computer applications for minimum of 06 months duration as evident from documents. Desirable Qualification: Good typing speed skills. One year working experience in computer application and data entry, as evident from documents. Knowledge of excel and PowerPoint. Posting: Place of work will be at ICAR-NBFGR, Lucknow. Selection Process: The selection will be based on Academic Performance, Research Experience and performance in interview.